A snowboarder stands on top of the Mount Snow’s North Face before heading down the trail. On Thursday, Dec. 6, 2018, the southern Vermont ski resort had 40 trails open. This weekend, more southern New England and New York state areas will begin the season. This weekend, there are more choices to ski or snowboard closer to home. Thanks to cold temperatures for snowmaking, more southern New England and New York areas will have their season premieres. In Connecticut, Ski Sundown in New Hartford kicks off its season Friday with lifts turning from 3 to 10 p.m. Weekend hours are 8 a.m. to 10 p.m. Saturday and 8 a.m. to 4 p.m. Sunday. It plans to have six trails open. Mohawk Mountain in Cornwall will be open from noon to 10 p.m. Friday; tickets are 25 bucks. On Saturday, lifts will be spinning from 8:30 a.m -10 p.m. and 8:30 a.m. to 4 p.m. Sunday. Tickets will be $40 on the weekend. It plans to have three trails; Nutmeg, Pine and Mohawk. Mount Southington that kicked off its season last Saturday will be open this weekend with more trails. Powder Ridge Mountain Park in Middlefield has also been blowing snow, but has not yet announced when it will open. In Massachusetts, Butternut in Great Barrington opens Friday with $25 lift ticket for adults. That midweek price remains one of the best ticket lift ticket deals in the East. Weekend tickets will be higher. Catamount in South Egremont, miles over the Connecticut border, will open Saturday. Jiminy Peak reopens Saturday after a nice stretch of snowmaking. Base depths were built on its “bread & butter” trails like West Way, Grand Slam, North Glade, Lower Glade, Grouse Run, Foxes, Slingshots, 360, 180 and Cricket. Berkshire East will also reopen on Saturday. In New York’s Catskills, Hunter, Windham and Belleayre Mountain have up to half their trails open. Across the East, ski conditions are steadily improving with more open trails being added every day. The long-range forecast calls for continued cold temperatures throughout next week. Farther north, many resorts were blessed with more than two feet of snow in the last two weeks. Sunday River in Maine was the biggest winner with up with 40 inches of snow. New Hampshire areas in the White Mountains like Bretton Woods, Wildcat and Cannon had between 15 and 22 inches in the last week. 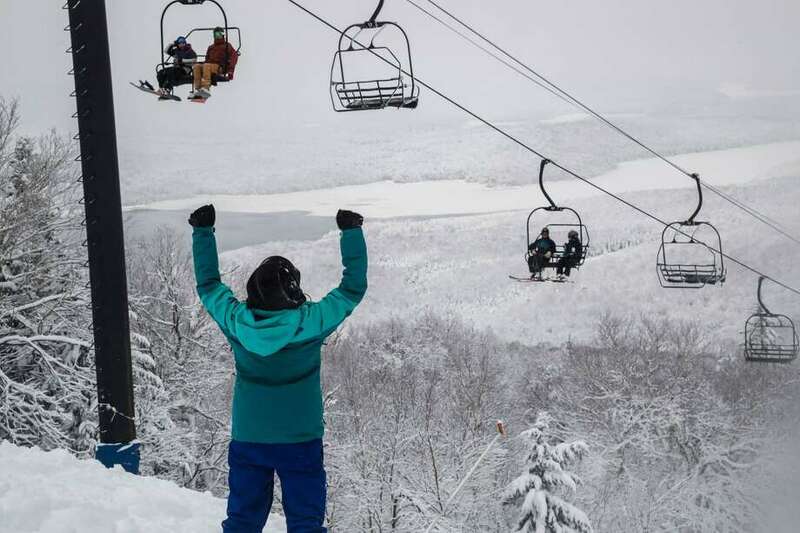 Those with holiday plans in Vermont are guaranteed a White Christmas after an early present of nearly two feet of snow fell at Mount Snow, Stratton, Okemo, Killington, Sugarbush and Smuggler’s Notch. For Vermont ski conditions, deals and events, visit Ski Vermont. Those planning to ski in the north this weekend, should check out the Mountain Point forecast HERE. Mad River Glen, that has no snowmaking, received 34 inches of snow. “We went from closed to 100-percent open overnight,” said Marketing Director Eric Friedman. The natural snow and a long stretch of cold temperatures comes as a crucial time as resorts work to aggressively expand terrain and deepen snow bases for the busy holiday week. The catch? You have to buy them online and the amount of cheap tickets is limited. See you there!